A cosy comfortable collared cowl uk format pattern that will look smart and add a little sophistication to your favorite outfit when made in complimentary colors, the cowl is made in the round so can be easily slipped over your head, leave plain or decorate with your favorite accessory. Row 2 – 3ch, 1tr into each tr to end, ss to top of 3ch on beginning of row. DNT. Rows 3 to 11 – Rpt Row 2. Fasten off. Turn. Collar – With WS facing join colour 2 to first ch on starting ch edge, work 1ch, 1dc into base of 1ch, 1dc into each ch to end, ss to first dc on beginning of row. Turn. Pattern Row 1 – 1ch, ss into base of 1ch, * 1tr into next dc, ss into next dc, * rpt from * to * to last dc, 1tr into last dc, ss to ss on the beginning of row. Turn. Pattern Row 2 – 1ch, 1dc into base of 1ch, 1dc into each tr and ss to end, ss to first dc on beginning of row. Turn. Rpt Pattern Rows 1 & 2 six more times. Rpt Pattern Row 1 once. Fasten off. Finishing – Weave in all loose ends of yarn and trim off, fold collar on to RS of cowl, decorate with an artificial flower. Hope you enjoy this free crochet pattern for a collared cowl, make sure you pin this pattern for later. Hugs and happy crocheting folks. The written instructions and pictures for this collared cowl uk pattern are copyrighted to crochet ‘n’ create © 2017. 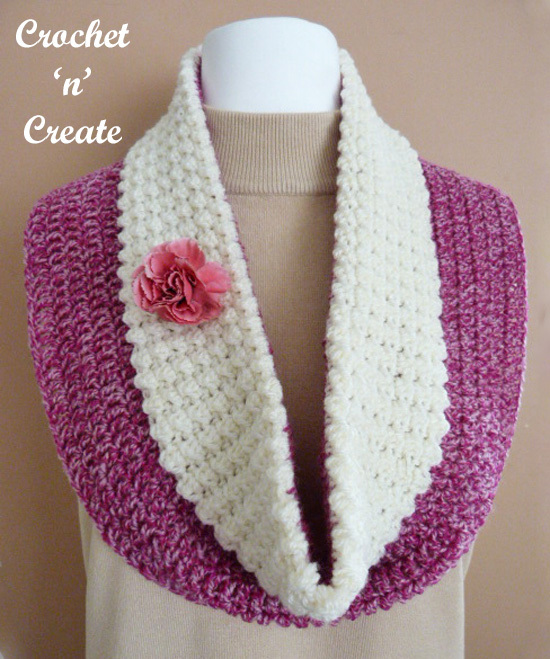 You are welcome to sell the finished products made from the free crochet collared cowl uk pattern, I just ask that you use your own pictures and put a link back to crochet ‘n’ create. 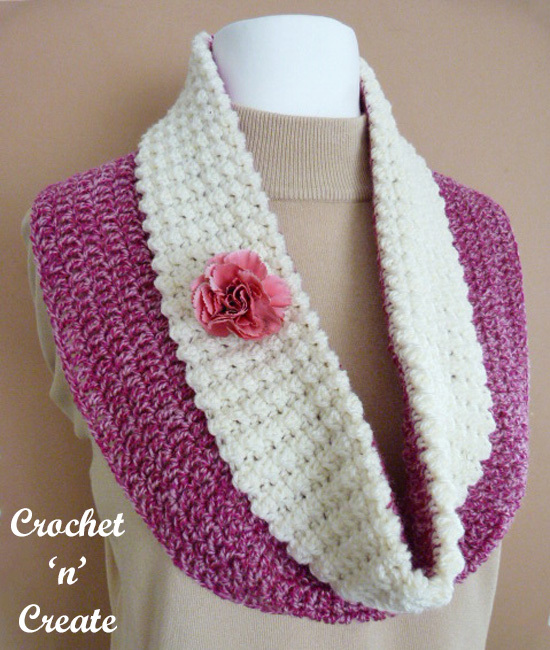 If you wish to share this crochet collared cowl uk pattern on social media or your blog please only use a direct link to the pattern page on crochet ‘n’ create. This entry was posted in crochet cowl, Free Crochet Pattern Finds and tagged crochet, crochet cowl, crochet scarf, free crochet patterns on 6th October 2017 by crochetncreate.